Who doesn’t like free Lyrica to buy buy topamax online without prescription family fun? 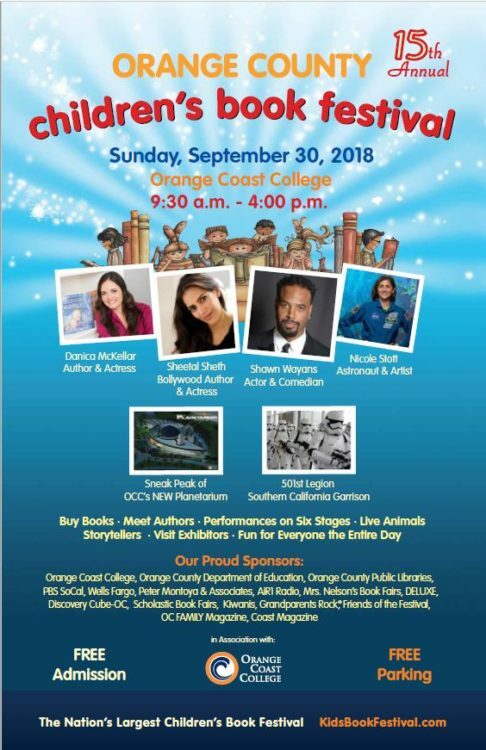 If you know anyone in Southern California with kids in their lives, you have to let them know about the Orange County Children’s Book Fair on Sunday, September 30th. Whether you are an aunt or uncle, teacher or parent, family therapist or librarian, the OCCBF offers a full day of free family fun. Biggest Festival of Its Kind in the U.S. The 15th annual festival in Costa Mesa promises to be the biggest one yet. With hundreds of authors, illustrators, and actors, and performances on six entertainment stages, there will be something for everyone who loves children’s literature. BOOKS!!! From debut authors to perennial favorites, you’ll find books in every genre for all ages from baby books to YA. It’s FREE! There is no admission fee and free parking. And plenty of booths will have drawings, giveaways, and free schwag, like stickers and bookmarks. Petting Zoo. Many young kids love animals. So do adults. Come visit the critters in the animal area. Entertainment on 6 stages. Enjoy, dancing, singing, speakers, magic tricks, and live readings of books. Authors & illustrators! Meet hundreds of us at tables and booths across the campus; get the latest book and have it autographed. A real astronaut. Meet Nicole Stott who will inspire and educate with stories of her experiences. Sneak preview of the new planetarium. The construction of Orange Coast College newest facility is due to be completed in 2018. Be among the first to learn about this great new facility. Train ride & miniature trains. Railroad aficionados can ride around campus and see displays of model trains. Galactic Adventure Scavenger Hunt. For the first time, OCCBF is sponsoring a festival-wide hunt for stars. Clues at every booth. Check out the great giveaway baskets for the diligent winners who follow the trail to treasure. Star Wars Stormtrooper Garrison. The evil empire will be on parade for those of you who can’t get enough of galaxies far, far away. If you love children’s books this is the place to be. Kids will enjoy looking for their new favorite character. Planning a library for your new baby or grandchild? Come browse the picture and board book offerings. Do you have a reader who can’t get enough of a particular niche genre, whether it’s mysteries, dinosaurs, joke books, STEM education, or teen romance, you’ll find something for every taste here. If you are a teacher or librarian, this is a great chance to line up speakers for your calendar with topics to fit every event. And don’t forget to fill gaps in your bookshelf. Adults who know just how good YA novels can be. Kids and adults both love to meet the writers and artists who make literary magic happen. They’ll be happy to talk to you and answer your questions. I’d love it if you stop by my table (C4) and put your name in the drawing for a Kindle Fire & other prizes. You don’t have to be present to win. I’ll have an acrobatic entertainer roaming the sidewalks and giving away stickers. Check out the gorgeous art by Daria Theodora for my upcoming kids book, “Misho of the Mountain” while you visit. You’ll be amazed! Coming out this year, Misho’s story is a modern myth of perseverance and gratitude, friendship and adventure. It’s a great tool for parents and therapists, too. Early Chapter book for ages 5-9. Check out the lists of exhibitors at the OCCBF website to see if your favorite author or illustrator be there. Please pass the word around about this fun family event. I look forward to seeing you there!